Mounting a Thermal Test Chip (TTC) directly onto a Thermal Test Board (TTB) results in a set of tools, referred to as Thermal Test Vehicles (TTV) that perform the basis for TIM thermal characterization under application-oriented measurement conditions. Availability of these tools creates a de facto standard that enable both TIM manufacturers and TIM users to compare measurement results under the same conditions. TTVs are available with bare die surfaces of 10.23mm square (TTV-4101) and 12.8mm square (TTV-4102). Application information on these products can be downloaded here. Larger and rectangular sizes are available on a custom basis. 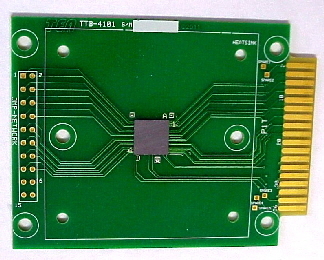 TTB-6101 for socketed attachment of the TTV to the board. Both boards are universal in nature so that all TTV contacts are available for configuring by the users for access to specific TTV capabilities. Edge finger connection allows the boards to be easily and quickly inserted into, or removed from, the measurement apparatus. The TTB-5101 will will operate in a 130ºC sustained temperature range. The TTB-6101 with the open-top socket will operate in a 120ºC sustained temperature range. Through holes are provided for heat sink mechanical mounting. A backing plate for is optionally available. For more information on TIM Characterization Tools, please click here.